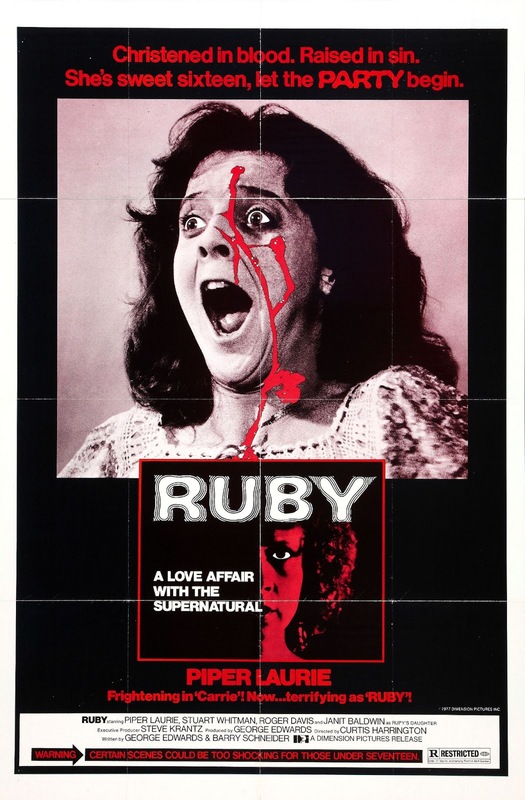 While the majority of experimental avant-garde auteur turned occult-inclined cult director Curtis Harrington’s films were either senselessly butchered by studios and/or some sort of pompous prick of a producer, virtually every one of these tragically tainted films, including Ruby (1977)—a more than worthy rip-off of The Exorcist (1973) that features a seamlessly assembled hodgepodge of conventions from horror, thriller, film noir, Golden Age Hollywood melodrama, and gangster films, as well as a comforting dose of camp—make for singularly pleasurable experiences, sort of like Twilight Zone episodes on steroids, except all the more sinisterly sardonic. In fact, despite being one of the highest grossing independent films of its time before the release of John Carpenter’s iconic slasher flick Halloween (1978), Harrington ultimately abandoned his authorship of Ruby by going to the Directors Guild and having the director’s name credited as “Alan Smithee” because not only did writer/executive producer Steve Krantz (producer of Fritz the Cat, Cooley High) change the ending against the director’s will (which Harrington and star Piper Laurie refused to re-shoot, so C-grade horror hack Stephanie Rothman did the dirty job), but also released a bastardized version of the film for television missing the best violence scenes, which were replaced with an apparently pointless subplot involving two characters that were nothing more than extras in the original theatrical release of the film. 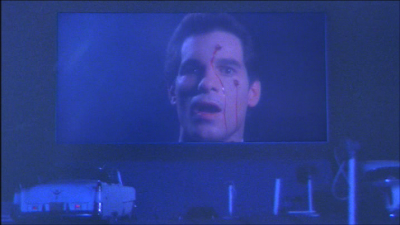 Luckily, about a decade ago, VCI Video released a DVD of Ruby that would amount to the closest thing to a director’s cut (it is actually the original theatrical version that unfortunately features Krantz’s conspicuously crappy ‘horror’ ending as Harrington's original poetic ending was permanently lost), at least as far as Harrington’s original vision was concerned. As someone who never understand the seemingly hysterical hype surrounding The Exorcist (what is so strange about a Hollywood Hebrew directing an ostensibly ‘Catholic’ themed film about demonic possession?! 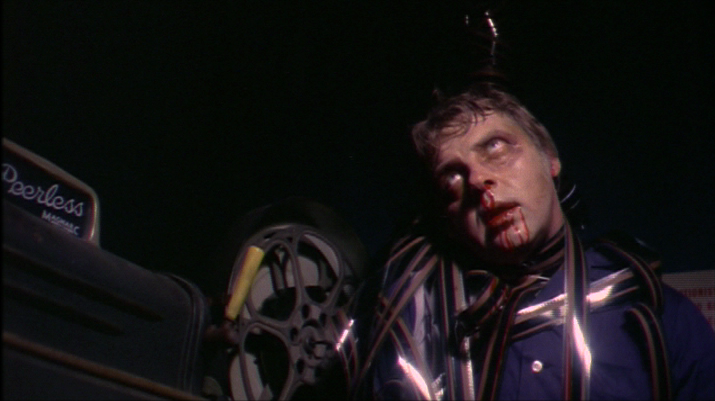 ), I was not particularly irked to find out that conman screenwriter Krantz penned Ruby with the rather blatant intention of cashing in on Friedkin’s rather overrated yet undeniably financially successful flick, as auteur Harrington managed to turn it into his own idiosyncratic, if not blurred, vision, considering the artistically restraining circumstances. A reflexive movie set in a drive-in made for drive-ins, Ruby can no longer be experienced the way it was meant to be considering the almost complete extermination of outdoor movie theaters, but like Demons (1985) directed by Lamberto Bava, Harrington’s creepy camp horror-noir hybrid makes for the next best thing as a potent, albeit discernibly flawed, piece of nightmare nostalgia, featuring burnout gangsters being strangled by film reels and hanged from giant drive-in movie screens, among other silly yet strangely charming Harrington-esque scenarios. 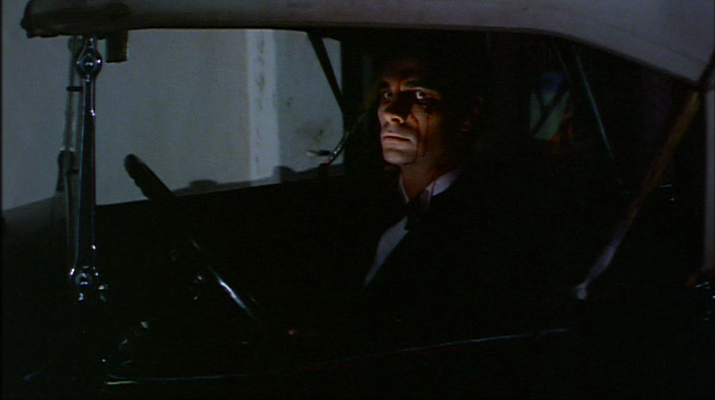 As phantasmagorically depicted during the opening scene of Ruby set in rural Florida during 1935, sleazy yet suave gangster Nicky Rocco (Sal Vecchio) was gunned down by his gang members while in the middle of a romantic night of swamp-side wine drinking with his pretty and pregnant gun-moll Ruby Claire (Piper Laurie of Carrie (1976) and David Lynch’s Twin Peaks (1990-1991)). Apparently, the head mafia boss Jake Miller (Fred Kohler Jr.) did not take kindly to the fact that Nicky was an ambitious young who also loved Ruby, the Dietrich-esque Jazz singer. While gasping his last breath, Nicky, like any self-respecting Guido career thug, vows bloodthirsty revenge and he will ultimately use his unborn daughter to carry out his special Sicilian blend of supernatural vengeance. Flash forward 16 years later to the year 1951 and Ruby is a has-been diva who now makes her living owning/running a drive-in movie theater that anachronistically plays B movies like Attack of the 50 Foot Woman (1958). Despite the fact they all played a part in killing her great love Nicky, Ruby has employed all the members of the mafia gang, who have just gotten out of jail after serving lengthy prison sentences, to run the drive-in theater for the delight of a bunch of local yokel hicks in a rather socially absurd manner totally at odds with cinematic genre conventions. Ruby also has a steady relationship with sensitive yet stoic mafia man Vince Kemper (Stuart Whitman), who helped raise her and Nicky’s 16-year-old daughter Leslie (Janit Baldwin), a mute bug-eyed girl of the seemingly autistic sort. Leslie’s lack of character and inability to speak is more than made up by the fact that she is a medium who can have spirits enter her body, but, rather unfortunately, her deceased dago daddy is a deranged fellow who is about to bring death to his ex-compatriots via his sensitive spawn. After a couple gang members are brutally murdered in a ritualistic fashion, it does not take long for Ruby and Vince, who dump their friends’ corpses into a river to avoid pesky policemen, to realize that Nicky is making good on his promise of spiteful spectral necro-slaughter. In the hope of stopping all the spooky slayings occurring around the theater, Vince has his parapsychologist friend Dr. Paul Keller (Roger Davis of Harrington's TV-movie Killer Bees (1974), as well as Dark Shadows) see ‘what’s the matter with Leslie’ and determine if it really is the Guido ghost of Nicky who is responsible for the mysterious killings that have plagued the quaint Florida drive-in. Not long after Nicky enters his daughter Leslie’s body and beats up Ruby after accusing her of setting him up at the time of his barbaric death, but, in reality, the little lady never committed treachery against her lover, but instead, inevitably got sadistic revenge against Jake, the jilted lover and the mastermind of the mobster-on-mobster mob hit. After Nicky’s archenemy Jake, who is now blind and wheelchair-bound and no longer a powerful Mafioso Don, rolls into the room dead with a knife symbolically pierced through his heart, Ruby reveals to Doc Keller that she avenged her perished lover’s death by gouging out the eyes of the man who ordered the hit of her man. After using his daughter’s body to levitate and perform telekinetic murders, Nicky ultimately convinces Ruby, who is more than willing, to meet him at the scenic swamp where he was killed. In one of the cheapest, most tasteless, and absurdly anti-climatic tacked-on endings in horror history, Nicky’s skeleton, which resembles the cheap sort of plastic Halloween decoration you find at Wal-Mart, pulls Ruby under water, thus reuniting them for eternity. Like virtually any Curtis Harrington film, Ruby is big on atmospheric and morbid yet merry dark humor and, as the director described in his memoirs, “the film has found an admiring audience in Europe, and every once in a while, I meet someone who considers it one of my best films.” Indeed, as someone who has become quite disillusioned with the horror genre, I find that Ruby—with its quasi-campy imagery and persuasion, cause-and-effect period piece setting, sweetly sadistic diva anti-hero, and nonchalant mutilation of genre conventions—makes for a much better way to waste 90 minutes or so than watching any of the films from the Friday the 13th series or even The Exorcist. Although Curtis Harrington would go so far as admitting that directing Ruby would prove to be “the most nightmarish experience” of his career and that he gets “very angry” anytime he re-watches it, the filmmaker’s auteur signature bleeds beauteously a number of times throughout the work to distinguish it among the totally trashy exploitation trash that it is associated with. In terms of comparable works, Ruby is to Harrington’s oeuvre what Touch of Evil (1958) is to Orson Welles, Caligula (1979) is to Tinto Brass, and Wild Side (1995) is to Donald Cammell, as a cinematic work ravaged by corrupt and uncultivated producers who sacrifice cinematic greatness for the quite dubious gamble of a hefty monetary return. Describing the producer who raped the soul of his film “both evil and stubborn,” Curtis Harrington was just one of many tragic victims of an industry that strives to create philistinic products for the peasant masses as opposed to cinema culture for the cultivated and would-be-cultivated. That being said, Ruby, ironically the director's most commercially successful film, will undoubtedly be most appreciated by those that already appreciate Curtis Harrington films, but will probably seem like a sort of ‘The Exorcists for Grandparents’ due to its nods to film noir, old school gangster flicks, classic Hollywood melodramas, and other films of yesteryear. I saw this as a child(on double bill with BURNT OFFERING) and found it utterly sick. It was sort of scary is a gruesome macabre way.